Medical negligence happens more often than parents think, or they are told. Every year, thousands of infants and children suffer serious injuries or die because of errors or negligence made by pediatricians, other medical professionals or hospitals. Medical errors are the third-leading cause of death among all Americans. As well, a recent study found that the U.S. has the third highest post-neonatal mortality rate (the number of babies who die between 29 and 365 days of life per 1,000 live births) and the highest infant mortality rate. Pediatricians and other medical professionals are expected to provide your child with prompt, correct and effective medical care. But to err is human and mistakes are made, including negligent errors or decisions that may result in serious injury to your child. If your child has been injured due to malpractice, you will need an experienced attorney to help with your child’s case. 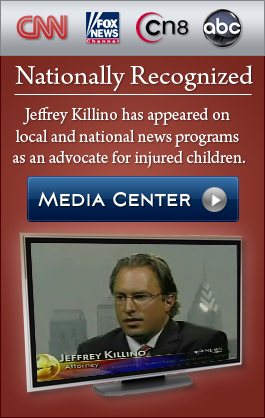 Pediatric malpractice lawyer Jeff Killino can help you obtain the compensation to which you are entitled for your child’s injuries. For a free evaluation of your legal options, contact attorney Killino at 877-875-2927 to schedule an appointment. Sometimes doctors and hospitals make it difficult for parents and guardians to get information on what happened or they may try to hide it. You may never know what actually happened to your child unless an attorney helps you uncover the facts. Surgical errors, including anesthesia errors, tonsillectomy, and heart surgery. Birth injuries affect an estimated 28,000 babies each year. Birth injuries can be the result of negligent prenatal care, during labor and delivery, or management of a baby after birth, including the baby’s care in the NICU and any resuscitation that took place. Medical Negligence and medical malpractice are not the same thing. Medical Negligence means an act of negligent treatment or an error in treatment by a medical professional to the patient, which isn’t a part of the accepted Medical Standard of Care. Medical Malpractice, on the other hand, happens when this negligent behavior causes undue injury to the patient. Medical-malpractice law involves actions for malpractice of general practitioners and nurses as well as medical specialists. According to the American Academy of Pediatrics (AAP), one in three pediatricians are sued for medical malpractice at least once during their medical careers. Negligence in medical malpractice litigation means that a healthcare provider either did something they should not have done, or neglected to do something that they ought to have done, which is measured against the expected, reasonable treatment that should have been provided under the circumstances. If your child has a condition that you suspect was caused by medical malpractice before, during or after the time of birth, you should contact an experienced medical malpractice attorney who focuses on birth injury cases, preferably one who has handled cases that involve the specific type of injury your child has. As well, you should seek legal help sooner than later because a statute of limitations (which varies from state to state) dictates how long you have to file a case. 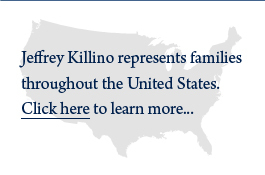 The Killino law firm has handled many pediatric medical malpractice cases and the team is experienced in acquiring and securing evidence. Medical-malpractice actions generally allege that the negligent care of the defendant pediatrician, doctor or other health-care provider was a cause of injuries sustained by a child who was under the medical professional’s care. Though medical malpractice laws vary from state to state, all medical malpractice actions require proof of certain elements. A standard of care has been designated to minimize any added harm to the patient. If a doctor isn’t able to treat the patients to the height of the standards and to the best of their ability, it is possible that the pediatric patient could receive some kind of injury. A pediatrician’s duty of care arises as a result of a relationship that has been formed between the patient and the pediatrician. Once the relationship has been formed, a pediatrician owes his or her patients the duty to provide the level of care that is considered reasonable and adequate for a pediatrician to provide. Expert testimony may be required to establish the duty of care owed by a pediatrician to his or her patients. Medical negligence occurs when a pediatrician or any healthcare provider breaches the duty of care owed to a patient. If the pediatrician exercised reasonable and competent care, as such care is defined for purposes of pediatrician medical malpractice liability, the pediatrician will not be found liable for injuries sustained by the plaintiff while under the pediatrician’s care. For example, a breach of a pediatrician’s duty of care that may lead to liability in an action for medical malpractice may occur. If a pediatrician fails to order the tests a reasonably prudent pediatrician would have ordered under the same or similar circumstances, and the failure to order such tests is found to have been a cause of the child’s injuries. The breach of a pediatrician’s duty of care toward a plaintiff child is not sufficient to impose liability on the defendant physician. The plaintiff must also establish injuries suffered and that the breach of duty was a cause of the plaintiff’s injuries. The plaintiff must prove this as well as other elements of a medical malpractice claim by a preponderance of the evidence, which requires a showing that it is more likely than not that the pediatrician’s less than adequate care was a cause of the injuries sustained by the child plaintiff. Such proof may also require expert testimony related to the particular injuries sustained, the possible causes of such injuries, and the likelihood that the injuries sustained by the particular patient were caused by the doctor’s breach of the duty of care owed by pediatricians to their patients. A hospital may be held vicariously liable (meaning a secondary liability, or holding an entity responsible for damages or harm caused by someone else) in medical malpractice actions for the negligence of pediatricians who are employed by the hospital, if the pediatrician’s negligence is found to have been a cause of a child’s injuries. Sometimes, physicians themselves are employers of a pediatrician whose medical malpractice results in a child’s injuries. In such cases, the employer physician may be held liable under a vicarious liability theory while the pediatrician whose negligent care resulted in the injury is held liable under a direct negligence theory. Medical malpractice claims can be complicated and confusing. You likely feel overwhelmed, but don’t give up. We have the experienced staff and legal resources that you need to file a medical malpractice lawsuit against an individual, hospital or healthcare system. Emily Jerry was two years old when she lost her life after a pharmacy technician filled her intravenous bag with more than 20 times the recommended dose of sodium chloride. Emily at 18 months old was diagnosed with a massive abdominal tumor and endured numerous surgeries and chemotherapy before being declared cancer-free. But just to be sure, doctors encouraged her parents to continue with Emily’s last scheduled chemotherapy session. On the morning of her final day of treatment, a pharmacy technician prepared the intravenous bag, filling it with more than 20 times the recommended dose of sodium chloride. Within hours Emily was on life support and declared brain dead. Three days later she was gone. A Toronto hospital settled for up to $21 million in case that left girl brain-damaged by septic shock and sepsis. In 2013, a 3-month old girl was neglected by her nurse and went into septic shock. She three cardiac arrests, renal failure, and more complications which left her with the following impairments: Leg length discrepancy; Right Hemiparesis; Abnormal Gait; Thrombosis in the Leg; Seizures; Gross Motor Delay; Fine Motor Delay; Speech and Language Delay; Loss of the tips of her finger; Fatigue; and 24-hour supervision/ attendant care. Up to $23 million for an inaccurate laboratory report causing a missed diagnosis of bacterial meningitis in baby. In 2015, a healthy 3-month-old sustained permanent brain damage after Hospital’s laboratory failed to report abnormal blood test results showing that she had a severe bacterial infection (Meningitis). She now suffers from severe, permanent disabilities including a severe learning disability, a seizure disorder, quadriplegia, endocrinological problems, cortical blindness, cognitive delay and deficits, communication deficits, diabetes. In 2013, a mother received a substantial settlement to help pay for her daughter’s future care. In the medical malpractice case (Gabriela Arteaga v. United States of America in United States Court of Appeals for the Seventh Circuit) the mother received prenatal care at a Health Center that neglected symptoms indicating that at birth the baby would weigh too much for a vaginal delivery to be safe, and failed to advise the mother to have a Caesarean section instead. In the course of the vaginal delivery the baby’s shoulder became stuck in the mother’s pelvis (the condition known as shoulder dystocia) because the baby was oversized (she weighed 11 pounds). During the delivery nerves in the baby’s shoulder were injured, resulting in a limited range of movement in her right arm, a condition that apparently has persisted.